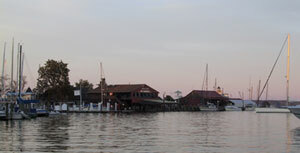 The perfect blend of historic charm and fine restaurants, unique shops, and the Chesapeake Bay Maritime Museum make St. Michaels truly a visitor's paradise. Guests of A Historic St. Michaels Vacation can easily stroll through the historic district of St. Michaels, visit the St. Mary's Square Museum, the Chesapeake Bay Maritime Museum, the many shops and restaurants, or take a short boat tour. Chartered boat rentals and horse drawn carriage rides are available as well as hunting and fishing guides. Golfing, biking and tennis are popular athletic activities. The area offers many exciting events throughout the year such as the Antique Boat Show, the Waterfowl Festival and Christmas in St. Michaels.